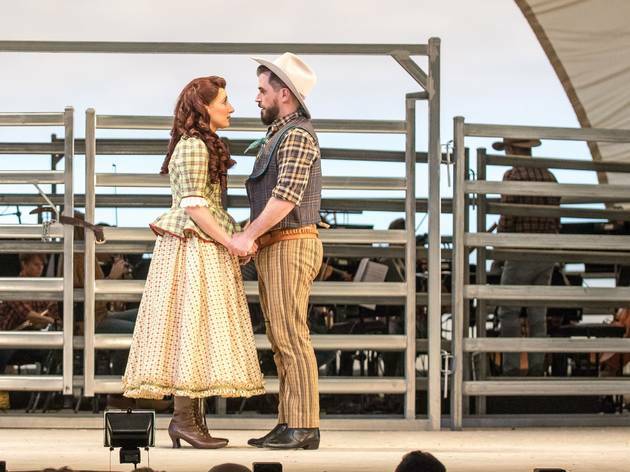 It was the first in what would prove an unprecedented run of smash successes; Rodgers and Hammerstein’s 1943 musical Oklahoma! ushered in Carousel, South Pacific, The King and I and finally The Sound of Music. It’s not hyperbole to call them the greatest musical collaborators of the 21st century, nor to say that their influence was so far-reaching it shows up in such contemporary fare as The Book of Mormon and even Hamilton. If their first work together doesn’t have the darkness or political heft of some of their later work, it’s still full of the kinds of innovations with which the pair would become synonymous. There’s the subject matter, for a start. For a show that’s built around the traditional marriage plot – girl’s flirtatious banter with her intended is threatened by dark and mysterious stranger – there’s a real sense of violence and toxic masculinity in play. 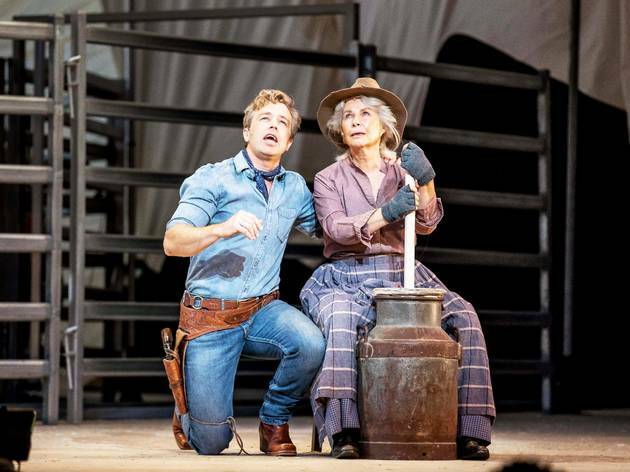 There’s also a sophisticated, if racially myopic, approach to time and setting; the show is set in 1906, a year before the state of Oklahoma was officially declared. This gives the musical a defining sense of nascent optimism, gloriously embodied in the opening number, ‘Oh What a Beautiful Mornin’’. 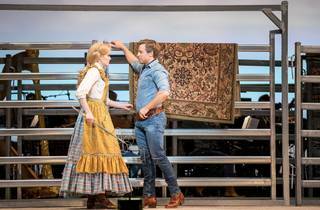 The opening bars of that song are famously sung offstage by cowhand Curly McLain (Simon Gleeson), the charmingly chirpy sweetheart of Laurey Williams (Anna O’Byrne), even if neither of them will admit it. Their inability to express their feelings leaves a tiny crack through which the disturbing Jud Fry (Ben Mingay) will enter, attempting to claim Laurey for himself. 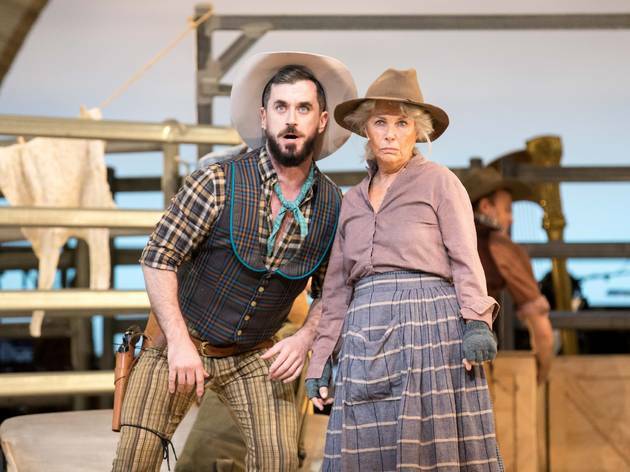 Mirroring the main plot, but delivered in a purely comic register, is the choice that Ado Annie (Elise McCann) has to make between her beau Will Parker (Bobby Fox) and the Persian peddler, Ali Hakim (Grant Piro). 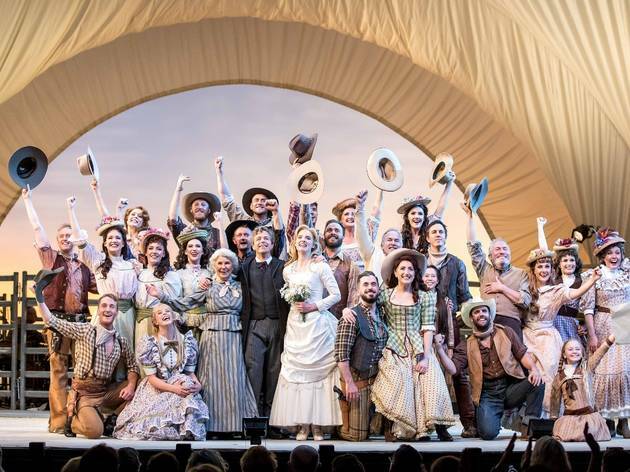 The Production Company has most success when it strips back its aesthetic and delivers simple and honest interpretations of classic or little-seen musicals from the past; they’re not the place to come for cutting-edge revisionist musical theatre. And that’s ok, because there’s a perfectly legitimate place for the kind of clear-eyed nostalgia this company excels in. Director Chris Parker understands this, and provides an utterly rousing and robust interpretation of the material that never feels heavy-handed or laborious. He’s aided immensely by his top-notch cast; there are so many fine performers here it’s almost an embarrassment of riches. 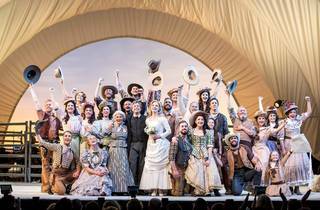 Gleeson is superb as the indomitably charming Curly; his generosity of spirit lights up the whole production, and his soaring vocals are meltingly good. 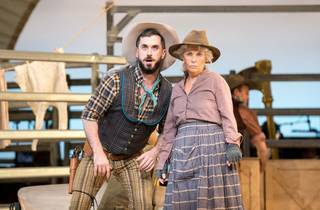 O’Byrne is reliably as good as ever as the thoughtful and doubting Laurey. Mingay is brilliant as the frightening Jud, underplaying the outright villainy of the character without losing any of the menace. Robyn Nevin is wonderful as the sanguine Aunt Eller, and Fox and McCann make a winning vaudevillian couple. Piro is also very good as Ali, precise and funny, but surely the time for white people doing brown-face – along with generic foreign man accents – and calling them Persian is behind us. Dale Ferguson’s set is ingenious in its own understated way. 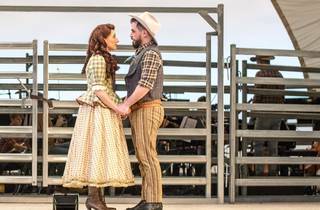 The cyclorama at the back suggests the bright open skies of Oklahoma, and the cattle fencing around the orchestra is evocative and flexible. Matt Scott’s lighting design is also key to the production’s effect; it’s so warm and suggestive it’s almost touching in its own right. Guy Simpson conducts with great poise and sensitivity, although the sound suffered badly in the second act, with cues missed on the mics and balances off. Some elements of Oklahoma! 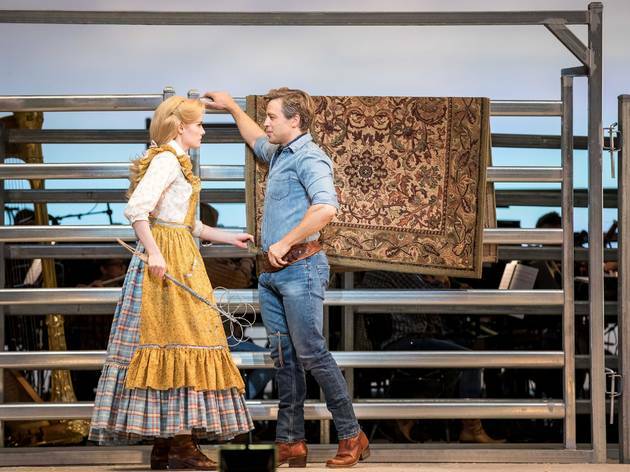 feel frighteningly relevant – Jud’s unquestioning entitlement to have Laurey simply because he wants her is packed with disturbing contemporary resonance – while some of it seems either quaint or off-colour. Ado Annie, the girl “who cain’t say no”, isn’t strictly a problematic character, but her tendency to seek love wherever she can get it was probably meant to be funnier than it reads now. And of course, everyone has to be paired up and safely ensconced behind their heteronormative white picket fences by the end of the show. 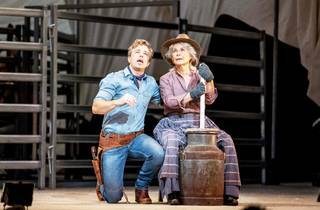 But for all that, Parker’s production proves that if a director gathers a magnificent cast and fine musicians, and then gets the hell out of the way, these old-time shows can be infectiously entertaining. This one’s the perfect winter tonic, although it should come with a warning: you’ll be singing though glorious ear-worms for weeks afterwards.